In her latest column, Sara Motta reflects on women's relationship with their bodies, including their experience of menstruation. Looking back to history, she argues, we begin to unravel the processes of disconnection, separation and estrangement that devalue, silence and make shameful the female body and its cycles. Recently, I participated in a moon lodge –a ceremony that honours woman’s menstruation. In this women-only space we celebrated and shared stories about our menstruation (or, “moon time”), our entry into womanhood marked by our first menstruation and our wild maiden self. In that weekend we were collectively re-creating and reclaiming ancient and contemporary practices and beliefs that honour female cycles and the female body and its relationship to moon cycles and life. Part of the ceremony involved sitting in a circle and sharing our stories about when we began our menstruation, the reactions we experienced from others, the support (or lack of) that we received and how we felt emotionally and physically. We passed around a hand made moon stick (or, talking stick) with a moon stone at the end, burnt at one end to represent the wise crone, covered in menstrual blood in its middle part to represent the mother and lover and left in its natural state at the tip to represent the wild maiden in our lives. As we passed the moon stick we spoke our stories, our sadness and joy from that time, our shame and pride and our experiences of connection and disconnection with our cycles and our bodies. What touched me in our stories was the shame and disconnect with our menstrual cycle time that many of us had experienced and continued to carry with us in our bodies and hearts. What also touched me was the distancing from our wild maiden self that we had experienced; the self-censoring of our true desires, words and actions for fear of judgment, rejection and isolation. When I came home, went back to work, continued with life as normal, I reflected on these discussions and experiences. How sanitised is our relationship to our bodies in this commodified and individualised society. How disconnected are we from that which is embodied. Menstruation is sanitised in media representations presented as a hygiene problem: something to be made clean and controlled. As a menstrual activist describes in her piece Menstrual Taboo ‘Menstruation must be concealed verbally as well as physically’. Through new brands of scented tampax to promises that sanitary towels are so discreet that ‘a woman can carry on as if nothing were happening’ we are told that we have something to be ashamed of, something that is better ignored and hidden. As one of the women commented in the moon lodge, they don’t even put red water when they test the sanitary towels in the adverts- it is blue! This fosters feelings of shame in relation to menstruation. Women’s shame about menstruation can result in body shame which leads to a desire to hide oneself and one’s body. 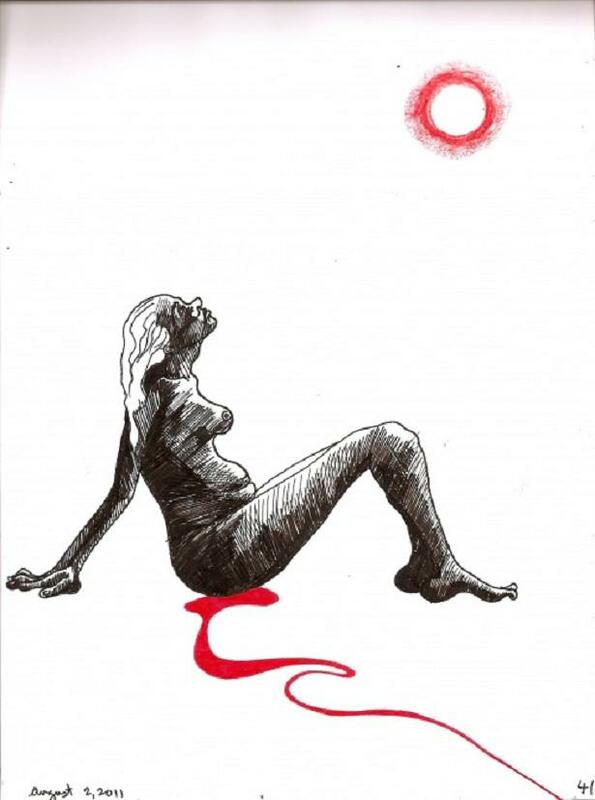 As menarche (the first menstruation) is associated with the development of sexuality, body shame about menstruation often develops into discomfort surrounding sexuality and a lack of sexual agency. As Ward et al. demonstrate in their research with young women in the US about their feelings about menstruation and sexuality, ‘These findings suggest that holding negative attitudes about menstruation may curtail women’s abilities to take pleasure in their bodies and sexual experiences, whether they are currently menstruating or not…. [these] correspond with dominant discourses surrounding female sexuality, which characterise women’s bodies not as sites of personal pleasure, but as objects of male desire’. Such understandings, representations and practices of menstruation mean that when a woman is menstruating she is supposed to carry on as normal and pretend nothing is happening. No recognition is given of this time in our cycles as this does not enter into what it means to be a professional in the workplace, a carer in the home or an activist in the community. Menstruation as a period of sensitivity, introspection, stillness and softness is banished from our world of constant demands to perform to the rhythms of patriarchal capitalism; rhythms that do damage to our earth, our bodies and relationships. A few days after returning from the moon lodge I began my moon time. As the dark red blood flowed from my body I sat on the bus speaking with a dear male friend of mine about the beauty of menstruation. He screwed up his face as if cringing; as if I had said something uncomfortable. I asked him ‘why are you doing that’, ‘what does me talking about menstruation make you feel’. He replied ‘unpleasantness, strange, makes me want to wash my hands’. How could we have reached such a place in our bodies, emotions and relationships? By looking back to history and the creation of the capitalist patriarchal subject we begin to unravel the processes of disconnection, separation and estrangement that devalue, silence and make shameful the female body and its cycles. From the 15th Century a particular hierarchy of separations is woven into the social fabric. This impacts upon the subjects’ (female and male) relationship with their heart, minds and bodies, with each other and with the earth. In this the rational mind, usually masculinised, becomes the epitome of our power over others and nature, power being associated with our ability to control and accumulate. The bodily and the emotions, often feminised, become associated with animal desire, the irrational and that which needs to be controlled. A web of relationships based on separations of the rational mind from the emotions and the body, of the feminised from the masculinised, of men and women, of blacks and whites was constituted. The consequences of this for the male proletarian subject are a distancing and repression of the emotional (other than acceptable forms of masculinised behaviour like anger and aggression) and the transformation of the body into a machine of work for the capitalist, and a subject wielding power over wife and children in the domestic sphere. For the female subject the consequences included woman’s bodies being medicalised and sanitised. Whilst women-only spaces, herbal knowledges, women who lived autonomous and independent lives and spiritual practices of connection with nature and the cosmos were demonised and criminalised. This transformed spaces in which sisterhood, female power and solidarity could blossom into privatised spaces of the individualised and feminised home and public masculinised workplace. Such separations were constituted through dividing women from each other through competition and isolation and importantly dividing women from their bodies, emotions and intellectual capacities. Women often become strangers and competitors as opposed to friends and allies. This is not merely something that happens to women. It is something that we internalise in our bodies and emotions; in closure, in feelings of shame, in physical pain and rejection and in silence, as our sharing in the moon lodge so powerfully expressed. It also something which creates the conditions for the sexualisation and objectification of women’s bodies and sanitisation and devaluing of women’s cycles. Yet if we search and connect to female traditions, before the break and separations of capitalism we find that there were communities that had a much greater connection with the feminine, female body and moon cycles. Women, when they were in their moon time, were often honoured and able to be in a woman-only space of rest, care and reflection, known as the “red tent”, “moon lodge space” or other. In these women-only spaces could be found women who were menstruating, pregnant women, as well as those who had reached menopause. The different cycles and stages of a women’s journey in her life were honoured as were the wisdom to be found in each. Ceremonies to honour menarche and menopause were enacted. The creativity, heightened intuition and emotional sensitivity that occur during menstruation were honoured. Spaces were created which allowed women to be still and cease responsibilities. This enabled the blossoming of the deeper wisdom attainable at this time. Multiple ways of knowing and knowledges were nurtured and viewed as essential for community well-being. So how might we reclaim the female body, its cycles and the female wild maiden self? The hyper-consumer and individualised society that we live in never stops, expects us to never stop performing and cuts off our sense of history and a different future with its focus on immediate gratification through consumer goods. Our workplaces reproduce this disconnected and debilitating rhythm with increasing stress, deteriorating conditions and an understanding of professionalism which denies and delegitimises all that is connected to the body and emotions. This shames and silences our natural cycles often leaving little space, time and possibility for collectively creating spaces of sisterhood, solidarity, sharing and resistance. Yet even here there are small practices which we can begin to undertake, practices that bring meaning, softness and humanity into our spaces by bringing back our desires and selves into our working lives not shunning and shaming them. To do this we can practice an ethic of slowness honouring our menstrual cycle. How might we do this? We can work less hard by working more softly in ways that do not conform to institutional expectations. In the spaces that we open up by working less hard and more softly we can do things (work related or not) that sustain, nurture and bring us pleasure. We can also begin to speak the unspeakable, to disrupt the silences and shaming in the cracks and margins of everyday interactions and conversations with people who we share a level of trust and connection with. This is not to force any woman to feel and understand menstruation in any particular way but rather to open the discussion so that we break the taboo and silence. We can take this to our home spaces, to slow down our work pace of domestic and child care duties. We can use moments of time, in the cracks of these demands to daydream, to bathe ourselves with tenderness, to make love and feel the blood flow onto and into our partners, to paint, draw, write poetry, to bleed onto the ground- connecting and grounding ourselves, rub our blood over us, honouring our bodies as art works and our blood as the paint of life, blood on our canvases. To connect to our wild selves. To be. We can also create our own moon lodges with trusted friends and family. We can create women-only spaces in which we give ourselves time to care for each other, connect with our creativity, and have stillness. Create a time and space outside of that of the crazy non-stop drive of marketised society. We can nurture and listen to each other in these spaces, share our stories and our histories in relation to our menstruation, our bodies, and our emotions. Reconnect with our feelings and each other massaging away the pain of trauma and shame. Transform spaces of strangers, isolation and competition into spaces of friendship, sharing and solidarity. Holding our bodies, honouring our cycles and loving our life blood open up pathways to healing from the separations that create so much pain for ourselves, each other and the earth. In the process new and unimaginable intimacies and connections with our own bodies and each other will blossom. Dedicated to my wild and free Sisters of Rhiannon. Thank you. Historically a moon lodge was in some ways the female counterpart to the Sweat Lodge ceremony. It was believed that women found their balance through menstruation in the Moon Lodge and also through honouring their moon time. In modern Wicca, and many Pagan religions, the Maiden is seen as the virginal young woman, or girl, who has not yet awakened. She is all about enchantment and new beginnings, youthful ideas and enthusiasm. She is associated with the waxing phase of the lunar cycle, as the moon grows from dark to full. The Mother is the next phase in a woman’s life. She is fertility and fecundity, abundance and growth, the gaining of knowledge. She is fulfilment — sexual, social, and emotional — and she is represented by the full moon. Springtime and early summer are her domain; as the earth becomes green and fertile, so does the Mother. Finally, the Crone aspect is the final stage. She is the hag and the wise woman, the darkness of night, and eventually death. She is the waning moon, the chill of winter, the dying of the earth. In some forms of feminist spirituality, the Maiden/Mother/Crone is used as an example of society’s treatment of women. While the Maiden is revered and the Mother is honoured, the Crone is pushed aside and reviled. Many women are trying to turn that around and reclaim the title of Crone. Instead of allowing themselves to be “old ladies” at Cronehood, these women are taking back the notion that with age comes wisdom. They are vibrant, sexual, life-embracing women who are proud to be labelled as Crone. Instead of hiding in the shadows, they celebrate the later years of life. There are also, of course, communities and collectives who develop similar practices and live by cosmologies of inter-connectedness in the contemporary period. To read about these issues see amongst many publications, The Red Tent by Anita Diamant, Wetlands by Charlotte Roche, The Body Remembers by Babette Rothschild and Trusting the Tides by Anne Dickenson. Thank you for sharing these powerful ideas. Had never thought about menstruation in this way although I had always been aware of how we are made to feel embarrassed and apologetic about it. I always noticed how, in a group of women with one man, if a woman mentions that she is on her period or anything related to it no matter how sanitised, she will automatically turn to said man and apologise for mentioning it, the other women’s faces often anxiously await his response. I have never witnessed a man apologising to a woman for discussing something that she does not experience by virture of her gender. This article visibilises yet another way in which patriarchy silences women, marginalises women’s experiences and makes us feel inadequate. Thanks, interesting, brave, gave me a new way of looking at things! as a man, I find this really important reading. Thankyou.